Often regarded as Costa Rica’s most beautiful beach region, the province of Guanacaste is located on the northern most Pacific coast of the island. The natural wonders of Guanacaste Province are unmatched, hosting more than ten different types of habitat, including mangroves, evergreen forests, rain forests, swaps, volcanoes, pristine river plains, and warm sandy beaches. Housing both the Rincon de la Veija Volcano National Park and Santa Rosa National Park, the area is a wildlife refuge for birds, mammals, reptiles and an impressive array of vegetation. The biggest draw for tourists is perhaps the beaches and warm blue oceans, but Guanacaste offers many other wonders to explore. Guanacaste Province is bisected by the Tempisque River, which flows from north to south, separating the sandy land along the coast from the mountain terrain along the eastern border. With the Guanacaste Mountains to the east, views of the craggy volcanoes and mountain peaks can be seen from the entire province. Within this mountain range, there are a collection of national parks, including the Parque Nacional Volcano Tenorio and Parque Nacional Guanacaste. Along Guanacast’s southeast border lie the Tilaran mountain range, which begin at the south end of Lake Arsenal and extend south along the coast, leaving only a small sliver of coastal lowland. At this lowland, the Inter-American Highway travels north into Guanacaste from Puntarenas. This Highway makes traveling among Guanacaste’s many tourist destinations easy and safe. From the Inter-American Highway, there are many side roads that lead to the highlands and tropical forest areas. This forest houses a host of exotic animals and vegetation, including monkeys, birds and reptiles. 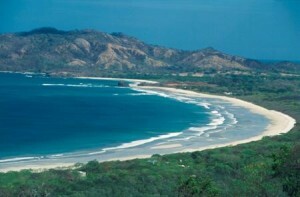 But it is the beaches that draw visitors to the Guanacaste Province. Because of this, what was once a small fishing region is now a bustling and growing tourist destination, with resorts being developed and a vast array of beachside accommodations. One of the biggest resort projects under construction is the Gulf of Papagayo Project, which promises to develop a whopping 2,300 coastal acres into a tourist wonderland of shopping, luxury accommodations and fine dining. This has prompted nearby construction of other huge complexes of hotels, villas and shopping space all the way from Culebra Bay to the beaches of Panama. The bay area of Tamarindo has also been transformed from a small fishing village to a tourist destination known for luxury accommodations and bustling nightlife. Tamarindo is Guanacaste’s largest coastal town, and a favorite holiday destination for travelers from Europe, North America and Asia. Offering some of the largest, and most pristine white sand beaches, Tamarindo Bay is unrivaled in Costa Rica as the premier tourist destination. Liberia is the largest town in Guanacaste, and serves as the capital of sorts, with the seat of the administrative and economic governments housed there. Liberia is a main landing point for many incoming travelers, as it offers the nation’s international airport, Daniel Oduber International Airport. With its close proximity to most of the Pacific coast destinations and towns, Liberia provides the perfect “home base” for travelers as they explore the coast and surrounding natural habitats. White sand beaches and natural wonders aren’t the only things that draw visitors to Guanacaste Province. 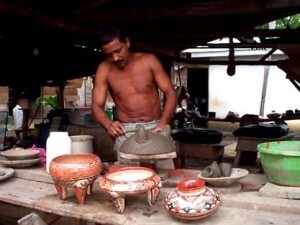 Traditions of several generations of potters can be found in the two cities of San Vincente De Nicoya an Guaitil de Santa Cruz. These potters have been fashioning clays using natural dyes and baked in wood burning ovens for thousands of years. These beautiful pieces can be traced back to the traditions and ancestry of the Chorotega peoples, an indigenous group who once inhabited this part of Costa Rica. Gauitil is located between the cities Nicoya and Santa Cruz, and is considered to be one of Costa Rica’s most important centers of native handicrafts. The ceramics produced here are traditional to the Chorotegas, passed down through hundreds of generation. The Guaitil Art Cooperative supports the entire community. Souvenir ceramics may be purchased in both Guaitil and Santa Cruz, where tourist sales of pottery make up the residents’ main source of income. The communities schools even teach the time honored traditions of pottery to its students. The Santa Cruz festival in January of each year is one of the largest festivals and celebrations in the region. Residents and visitors mingle to enjoy dancing, sports, games and to feast on wonderful local foods. This is an excellent time to explore the local pottery makers. Other festivities in the area include the Coco Beach festival in February and street festivals in Liberia in February and July. However, the biggest cites in Guanacaste aren’t necessarily the only places to visit in the province. Only a short drive away from Liberia lie some of the most pristine beaches and quaint, sleepy towns. Picturesque Conchal, with its shell powder sand and sparkling blue waters offers some of the best snorkeling in Costa Rica. Flamingo Beach, only one hour by car from Liberia, is a popular fishing destination that also offers perfect turquoise waters, luxury hotels and a surprising abundance of nightlife and clubs. Guanacaste is a favorite among bird watchers, with a wide array of native parakeets, toucans and other tropical favorites. Nature lovers will find hiking along volcanoes, trails through mangroves and beautiful protected national parks all at their disposal for exploring. The province is the perfect place for kayaking, sport fishing, horseback riding, and unique canopy tours available only in Costa Rica. Rich in history and culture, Guanacaste is surely the jewel of Costa Rica. With its great history and tradition held intact despite tourist growth, Guanacaste is the largest province in Costa Rica, which coincidentally also has the smallest population. This allows for the perfect blend of natural reserves and luxurious vacations, and makes Guanacaste a complete travel destination.